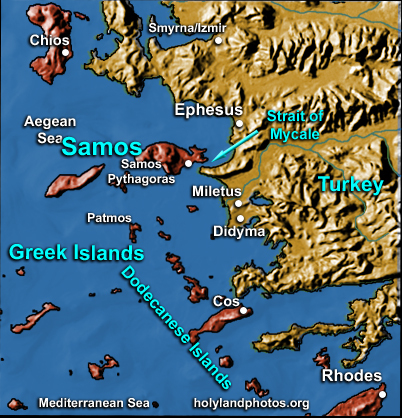 Samos is a Greek island in the Aegean Sea that is only 1 mi. [1.6 km] from the western shore of Turkey separated from it by the Mycale Strait. It was home of Pythagoras, the famous mathematician and the philosopher Epicurus. But for the ancients it was the place associated with Hera, the wife of Zeus whose cult was celebrated at the temple called the "Heraion of Samos." The route that Paul's vessel took from Chios to Miletus is carefully examined by Dr. Mark Wilson at the beginning of his article "The Ephesian elders come to Miletus: An Annaliste reading of Acts 20:15-18a." 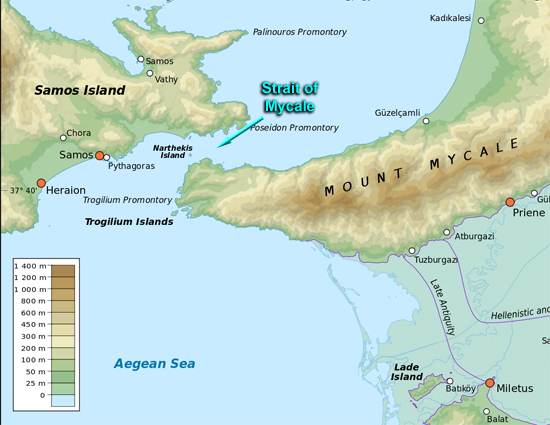 He argues that the vessel that Paul was on sailed through the narrow strait between Samos and Turkey—the "Mycale Strait"— and possible landed at the chief city of Samos—Pythagoras or at Trogilium closer to the (present) Turkish mainland. WILSON, M.. The Ephesian elders come to Miletus: An Annaliste reading of Acts 20:15–18a. Verbum et Ecclesia, North America, 34, sep. 2013. Available at: <http://www.ve.org.za/index.php/VE/article/view/744/1751>. Date accessed: 18 Oct. 2013.